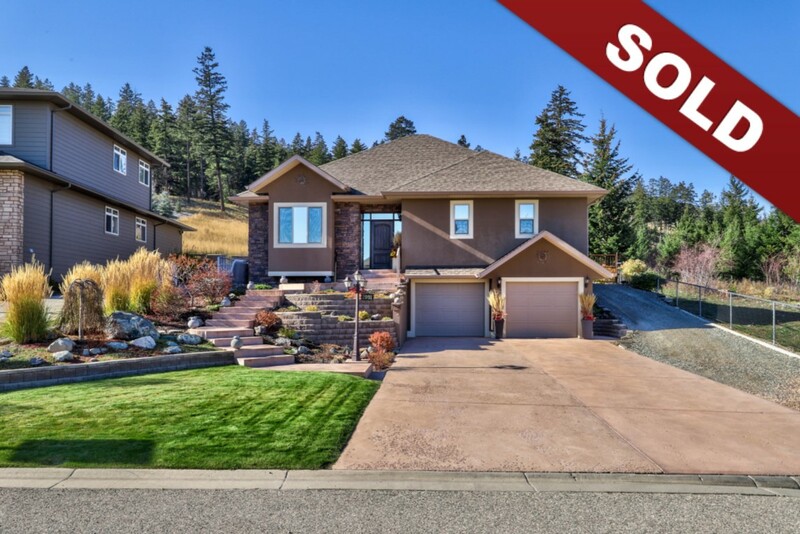 New Listing: 2091 Hugh Allan Drive, Aberdeen, Kamloops, BC $889,900. Extraordinary and unique come to mind when you step into this immaculate 3 bedroom, 3 bathroom, 2,700 square foot custom built home situated on a parklike .47 acre landscaped lot in Pineview Valley! The property is nestled next to the entrance of the Pineview Recreational Trails Park and features an impressive 25 X 35 Detached Shop with Geothermal heating, pellet stove, and loads of parking for your recreational vehicles and toys! The elegant main floor features an open living concept with light oak hardwood floors, ceramic tiles, skylights, beautiful hewn shelf-rock hearth gas fireplace, built-in speakers, stylish kitchen with large island, counter seating, tiled backsplash, granite countertops, undermounted sink and cabinet lighting, stainless steel appliances, notable alder cabinetry and generous dining area for entertaining. There is a laundry area conveniently tucked behind the kitchen with pocket doors and 2 walk-in pantry’s. Master bedroom with sumptuous master ensuite, his and her vanity’s, soaker tub, separate shower and oversized walk-in closet, 2nd bedroom with built-in window seat and an ensuite. Fully finished basement, large bedroom, family room, 3 piece bathroom and direct access into the oversized 2 car garage. The home has been constructed with central air, built-in central vacuum, security system, fully fenced yard, powered gate to the rear yard, underground sprinklers, 200 amp panel plus 100amp panel for the shop. Lovely 30×28 covered concrete patio with skylights, polar spa hot tub, retractable awning, waterfall/pond. Quality of construction, attention to detail and pride of ownership are evident throughout this one of a kind property! Only minutes to Aberdeen Mall, recreation, schools, TRU, transit and more.